Reading the contents of a decoder generally takes a long time, and with some command stations it's not even possible. The JMRI Roster stores the known values of decoder configuration values to make it unnecessary to read them from the decoder. It can contain "Roster entries" for an unlimited number of individual locomotives. Each Roster entry has an "identifier" (Roster ID) by which it's known. This is your name it. When the program wants you to select a Roster entry, it will ask you to pick from a selection box or menu containing Roster entry IDs. You can use anything you want for this: Road number, type, even "That crummy old model I need to repaint" or "My beautiful Shay". You can edit the contents of a Roster entry with the programmer panes. 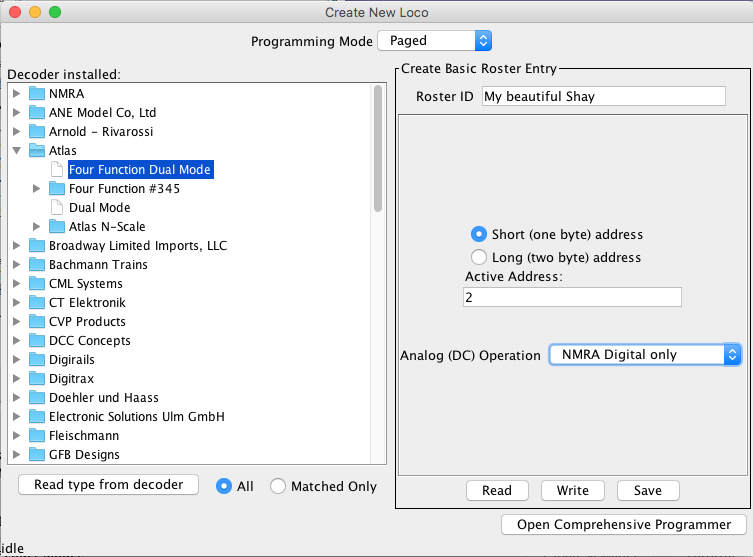 When you first open a JMRI programmer, you'll see a "Create New Loco" pane (pictured to the right). Your name for the new locomotive, see above. You can change an entry's ID later, in which case it will appear in new selection boxes, etc, with the new ID name. This is either a Short or Long Address, based on how the decoder is configured. To Read the information from a decoder with this address, Write changes to that decoder or only Save this entry to disk. Use these fields for whatever you want. These two fields are filled in based on the decoder that was selected when the entry was created. They can't be edited after that. You can put anything you want here. Some people have used it to record whether an NMRA plug was used, whether the decoder was soldered in, etc. With additional information about your Locomotive etc. "Create" is used to create a new Roster entry, even if you don't currently have a connection to a layout. When you select this, you're given a window in which to select a decoder type. Pick the right decoder type, the format you want, and click "Open". You'll see a DecoderPro-style window for changing the contents of the new entry. Don't forget to click "Save" when you're done! "Edit" is used to update the contents of a Roster entry, even when you don't have a layout connection (normally, if you do have a layout connection, you'll use the DecoderPro programming functions). When you select this, you'll get a window in which to select an existing Roster entry, a format, and an "Open" button. Once you click "Open", you'll get a DecoderPro-style window for viewing and changing the contents of the entry. Don't forget to click "Save" when you're done! "Copy" is used to create another Roster entry that's identical to the original except for it's ID. If you have a standard setup you'd like to use for new locomotives, you can create a Roster entry with all the right values filled in, and then copy it every time you want to program a new locomotive. Although it is possible to find the XML files defining Roster entries in the preferences directory, it's better not to mess with them directly. The "Export" command will create a new file representing a Roster entry, including all of the comments, CV values, etc. You can then take that to another copy of DecoderPro and import it into that Roster. 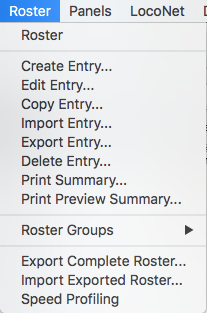 Export does not change your current Roster in any way, it just makes a copy for you of a specific entry. When you select "Export ...", you be asked to select the Roster entry you want to export, then you'll be prompted to select a new filename. You can call it anything you want, but it's best to put a ".xml" extension on the name. The combination of "Export" then "Import" allows you to bring a locomotives Roster entry when you move to another layout, with it's own DecoderPro installation. When you select "Import ...", you'll be asked to locate an XML file to import. It should have been created by an "Export" command. You'll also be asked for the ID of the new Roster entry to be created. This can be the same as it was before it was exported, or you can give it a new ID. This completely removes a Roster entry. You're asked if you're sure and a backup is made, in case of mistakes. This prints a summary of the entire Roster, listing the primary information for each entry. For a more detailed listing of a specific decoder, see the "File" menu on the programmer screens. This shows the contents of the printed summary on your screen, so you can preview it before printing.